Fresh herbs are a wonder to cook with. Nothing really matches the zingy brightness that makes their presence felt in a way that their dried cousins never can achieve. I love having fresh herbs always at the ready…ready to be called to action at any moment. I dream of having big pots of them scattered around the kitchen, where I could tear off handfuls of herby sprigs and toss them into my dishes like some twittering Food Network diva. Alright. Moving right along. Most of the time, I’m not whipping up dishes that call for a fresh bunch of herbs meal after meal. By mid-week, the little fragrant bouquets that were so full of promise in the beginning start to look alarmingly glum. They are plucked at, having been used for this dish and that, but always left with some sullen wilty sprigs that have lost their purpose in life. Which is so sad really – such a waste for one (even a few sprigs of herbs left to rot is food waste and you know I want to avoid that!) and, my goodness, we all have a purpose! Even a few melancholy leftover herb sprigs. This is one of my favourite ways to use, or give new purpose to, odd bits of leftover herbs. Quite simple…no reinventing the wheel here surely, as I’m sure loads of you do this, but just in case 😉 These eggs make me so happy in the morning, when I am usually an incoherent amoeba until my first cup of coffee. 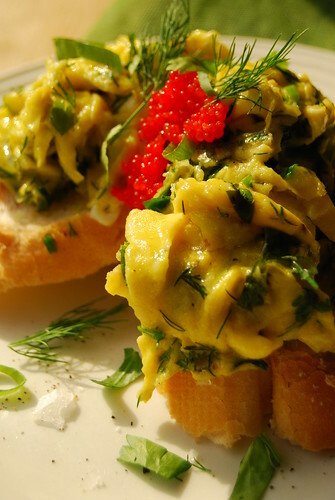 The transcendent simplicity of good scrambled eggs shot through so thoroughly with greens always heralds a fresh, bright start. This is so straightforward that it doesn’t even warrant a recipe. For two eggs (which would serve one me) I would use a couple of sprigs of whatever herbs I have lurking in the crisper. Use what you’ve got, you’ll be surprised how unlikely combinations can work so well under the auspices of a good egg. Pick the leaves off and roughly chop – I used about two tablespoons of chopped herbs here – they aren’t a garnish…the eggs should be bursting at the seams with them. For this dish I used parsley, dill, and green onion (sliced). Heat some olive oil in a pan (butter will do nicely too). Add the white parts of the green onions first – if I’m using green onions or leeks I like to sauté the white parts first just to soften a bit…about 10 seconds is good. I then pour in the eggs (which I have whisked lightly already) and cook as I did here…which is how I like my scrambled eggs. Add the herbs right before it’s done. When done to your liking, quickly pile it on some toast and enjoy warm. You can choose to garnish the eggs further with other leftovers that may be vying for your attention. I put a dollop of caviar on top here – left over by a friend after a fun afternoon of shooting a “cooking party” for a local food magazine (more on that when it’s published!). Cheese would also be a fantastic addition to the eggs – tossed in while cooking.